With a stay at Beachscape Kin ha Villas & Suites in Cancun (Avenida Kukulkan), you'll be minutes from Plaza Caracol Mall and close to La Isla Shopping Mall. 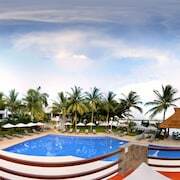 This beach resort is within close proximity of Forum By The Sea Mall and Cancun Convention Center. Make yourself at home in one of the 139 air-conditioned guestrooms. Rooms have private balconies or patios. Complimentary wireless Internet access keeps you connected, and cable programming is available for your entertainment. Private bathrooms with shower/tub combinations feature complimentary toiletries and hair dryers. Treat yourself with massages and facials. You can take advantage of recreational amenities such as a health club and an outdoor pool. Additional amenities at this resort include complimentary wireless Internet access, concierge services, and babysitting/childcare (surcharge). Enjoy a meal at one of the resort's dining establishments, which include 2 restaurants and a coffee shop/cafÃ©. From your room, you can also access room service (during limited hours). Quench your thirst with your favorite drink at a bar/lounge. Buffet breakfasts are available daily for a fee. Featured amenities include a business center, dry cleaning/laundry services, and a 24-hour front desk. Free valet parking is available onsite.